Caries is the technical dental term for cavities. Cavities are literally holes in the mineral surface of the teeth from acid that is produced by bacteria in the oral cavity when that bacterium is exposed to the food we eat. Early Childhood Caries (ECC) is defined as any cavity that is present in pre-school age children. However Severe Early Childhood Caries is defined as smooth surface cavities present before the age of 3. Severe Early Childhood Caries is often referred to as “baby bottle caries” or “bottle rot” and can have a major impact on the health and development of your child. Early Childhood Caries, and especially Severe Early Childhood Caries, is an increasing health problem in both developed and undeveloped countries. Although the cavity rate in the US was decreasing in the 1980’s and 1990’s, especially in children, we have seen a reversal of this trend. Today’s children are at an increasingly higher risk for cavities due to changes in diet, socioeconomic stresses, and shifting cultural/societal norms. What Causes Early Childhood Caries? The hard mineral structure of the tooth is susceptible to acid. Below a pH of 5.5, the enamel of the tooth begins to break down. Acid can come directly from the substances we eat. For example, many juices and sodas (even diet) are below the pH of 5.5. However, most of the acid comes from bacteria in the mouth fermenting the food we eat and the liquids we drink. You can read more about this process on our previous blog post here. Sometimes parents and other caregivers do not realize that a baby’s teeth can start to decay as soon as they appear in the mouth. In addition, many do not realize that nutritious food and drinks such as milk, formula, breast milk, and fruit juice have naturally occurring sugars that contribute to the decay process. When children go to bed with a bottle containing milk for example, liquid sits in the child’s mouth for an extended period creating a perfect environment for bacteria to cause decay. Your child’s first dental visit should occur at the time of eruption of the first tooth or before 1 year of age. Severe early childhood caries occur before the age of three, therefore it doesn’t make sense to wait until the age of 3. This is inappropriate information that has persisted from general dentistry years and years ago. This first visit is not intended to catch cavities or fill teeth, but to establish a dental home for your child. 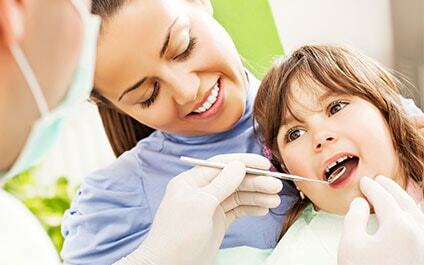 Well child dental visits are just as important as well child checks with your pediatrician. It also gives parents and caregivers access to the appropriate tools and resources to keep a child’s teeth healthy. Cavities do not form overnight. When decay first starts, it presents as an incipient lesion or a white spot of demineralization. As the decay progresses, the lesion cavitates and becomes yellow or brown. Once the internal dentin becomes affected, the outer portion of the tooth begins to chip away and crumble. Finally, the tooth decays away becoming brown or black with only the root remaining. The picture below shows a child’s teeth in the various states of dental decay. Recognizing these white spot lesions and going to see your pediatric dentist in a timely fashion can prevent a full-blown cavity from forming. The use of fluoride and good hygiene can reverse these lesions. Many parents do not realize that nutritious food and drinks such as milk, formula, breast milk, and fruit juice have naturally occurring sugars that contribute to the decay process. When children go to bed with a bottle containing milk for example, liquid sits in the child’s mouth for an extended period creating a perfect environment for bacteria. You can’t stop feeding your child nutritious food, but you can regulate when and how often your child is exposed to “sugar hits.” Limit between meal snacking and if a bottle is needed, use only water at nap/bed time. When your baby‘s first tooth erupts, begin cleaning baby’s teeth with a soft washcloth or small, soft toothbrush with a tiny smear of toothpaste with fluoride. At this age, your dentist or pediatrician may also want to prescribe fluoride supplements. Fluoride helps strengthen developing teeth making them more resistant to decay. Children that drink fluoridated community water should not receive fluoride supplements. Begin brushing your child’s teeth with a pea-size dab of toothpaste at the age two. Instruct your child to spit out the toothpaste after brushing. Continue to help your child brush their teeth until they have mastered this skill – usually around eight years old. Next Next post: When Should My Child See the Dentist?